The new school year has begun. So we decided to search the Trade Literature Collection for catalogs showing school furniture or supplies. And we came across this Robert Paton catalog which shows the furniture students in 1872 might have seen on their first day of school. 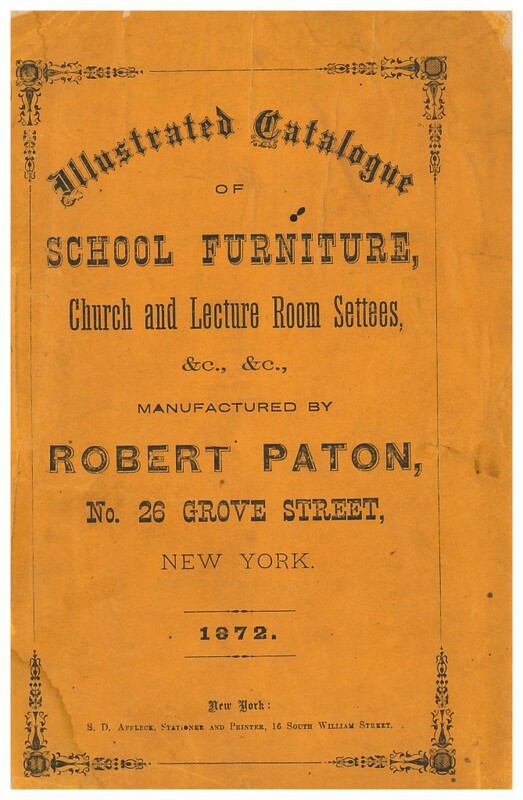 The catalog is titled Illustrated Catalogue of School Furniture, Church and Lecture Room Settees, &c., &c. and the furniture was manufactured by Robert Paton of New York. The company was established in 1848 but this particular catalog is dated 1872. The catalog shows several styles of desks, tables, settees, and chairs for schools, churches, and lecture rooms. Robert Paton, New York, NY. Illustrated Catalogue of School Furniture, Church and Lecture Room Settees, &c., &c., 1872, front cover of catalog. 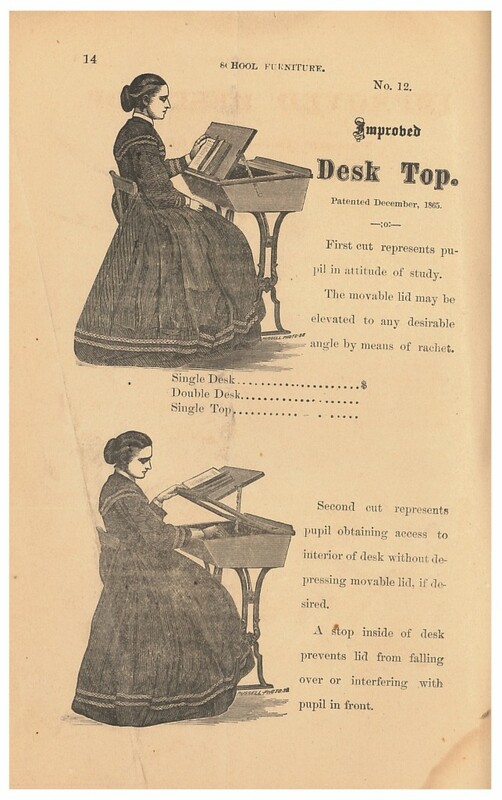 Illustrated below is the Improved Desk Top which was patented in December 1865. The desk top was moveable. As you can see in the image below, the student had the option of elevating the desk top to any angle preferred. But what if the student needed something in her desk? The other image below shows how the student could lift the whole lid without closing the desk top. The desk top stayed at the original elevated position. Robert Paton, New York, NY. Illustrated Catalogue of School Furniture, Church and Lecture Room Settees, &c., &c., 1872, page 14, Student sitting at desk equipped with the Improved Desk Top. This Robert Paton catalog is located in the Trade Literature Collection at the National Museum of American History Library. Interested in other companies that manufactured school furniture? The Trade Literature Collection includes other school furniture catalogs including one by J. L. Hammett described in a past blog post.